The red circles mean uh oh. Or do they? All of the ingredients were there. If form held, they would combine with anxiety to form a toxic stew, one that can paralyze my child, turn his favorite activity into the enemy, and take him to a place where he is hard to reach. I eyed the brewing storm from a short distance, waiting to see if it would form into a full-fledged twister and tear through the house. The storm passed. It did not touch down. It did not cloud the light and take us to a dark place. The ingredients scattered, the storm fizzled, and we were left with nothing but our normal evening routine. Well, not “nothing” but our routine. Something better than nothing. The storm’s passing wasn’t a happy accident. It had help, in the form of Ryan, who steeled himself against the negative energy and the rising winds and refused to let them enter his safe space. And afterwards, he told us all about it. For those new to the blog, Ryan has extreme anxiety over shots on goal totals. We do not fully understand why other than that they cause disruption to the order he prefers. His triggers are any time a team threatens to get 30 shots on goal in one period or 60 for an entire game. 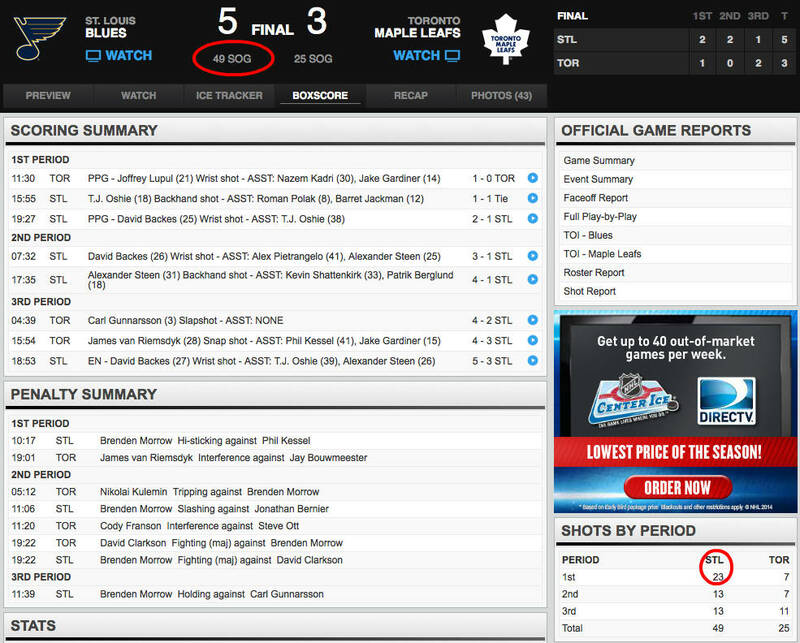 (Note, these are very rare occurrences in an NHL game.) When it happens, the episodes that result can be severe. It was these episodes that led us to seek treatment for anxiety, and OCD, specifically. I have written extensively of these episodes on the blog. For background, see here, here, here, here, here, here, here, etc. It bears noting that at 7 p.m. Ryan is always done with all his homework. We never have to ask him to turn off the TV and come upstairs at bed time. He does so voluntarily, at the same time each night. And he never complains when the routine has to be altered (as long as it’s for him, such as an evening hockey practice). Watching the games regulates him. It’s his way of finding normalcy and comfort after navigating another day, and we have learned to recognize that. It’s also why it makes me so angry and sad when anxiety dares to interfere. The Blues were visiting the Maple Leafs. All year, Toronto has given up lots of shots on goal. Lately, the Leafs have been terrible, and last night got off to an awful start. Toronto gave up 23 shots in the first period. I knew this because I kept an eye on the stats from the living room as Ryan watched in the basement, but also because he came up during a commercial break to tell me. He also told me something else: that he wasn’t nervous. Normally when Ryan declares he isn’t nervous, the opposite is true. Often it is a signal that the storm is brewing. I told him “great,” but made a mental note to keep an eye on the shots total. We haven’t had a severe anxiety episode over shots in some time. Would this be the night? Ryan knows, because he studies stats intently, that Toronto gives up a lot of shots. He’d be more nervous about the Leafs hitting one of his triggers than some other team. A few minutes into the second period, St. Louis’ shots total crept pass 30, putting the Blues on pace for 60-plus. It was also near Ryan’s bed time. There were no obvious signs that an anxiety attack was coming, but the ingredients all were there. If Ryan was nearing a meltdown, we’d know it. His angst, fear and frustration manifests audibly in a series of pained moans. But this time, nothing. At bed time, he came bounding up the stairs, a smile still on his face. Before he continued upstairs to brush his teeth he again told us how he hadn’t been nervous. Veronica and I heaped on the praise. She was the last to tuck him in, and they had a brief conversation about the evening. Not only did he repeat that he hadn’t been nervous, but he also made sure she knew that he wasn’t nervous despite knowing that a team that gives up a ton of shots was on pace to give up 60 well past the game’s halfway point. I’m not making any predictions about next time. I prefer to focus on this time. My son faced a circumstance full of anxiety triggers, and through self-calming and self-reliance managed to navigate it without incident. Afterwards, he practiced self-awareness and self-advocacy to tell us all about how he did it. And if that sounds like a lot of “self,” well, that’s exactly the point.